A sports car and luxury saloon in one, the new Panamera launch phase has officially begun. 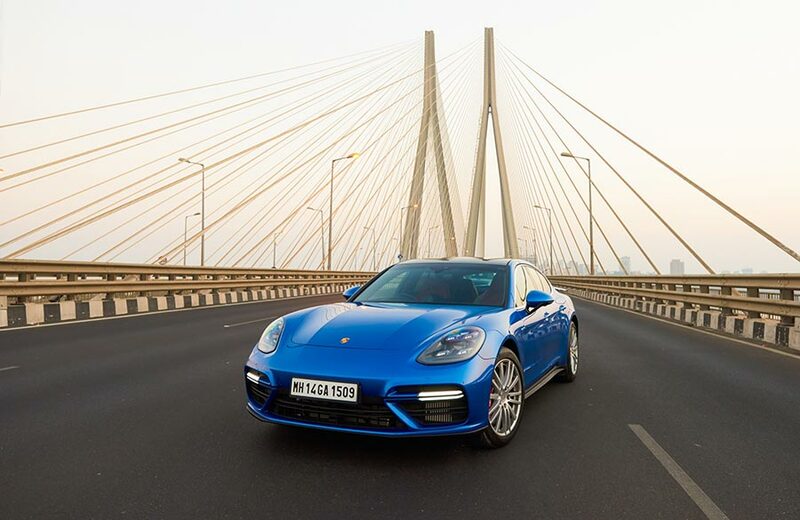 Porsche India, marked the introduction of the new generation by unveiling the all-wheel drive Panamera Turbo to attendees during an exclusive media event at Porsche Centre Mumbai. The model will also be available as an Executive version featuring a 150 millimetre longer wheelbase and an extended range of equipment. In its second generation, the Panamera has been redeveloped down to every last detail. Modifications to the engine, transmission, chassis and overall design concept, make it a performance icon in the luxury class. The new model further extends the boundaries between an ambitious sports car and a comfortable cruising car with technical highlights such as rear axle steering, electromechanical roll stabilisation and a three-chamber air suspension. Meanwhile, inside a completely new display and control concept greets the driver and passengers upon entry. In many areas, touch-sensitive surfaces replace classic hard keys, and high-resolution displays merge into the interior. 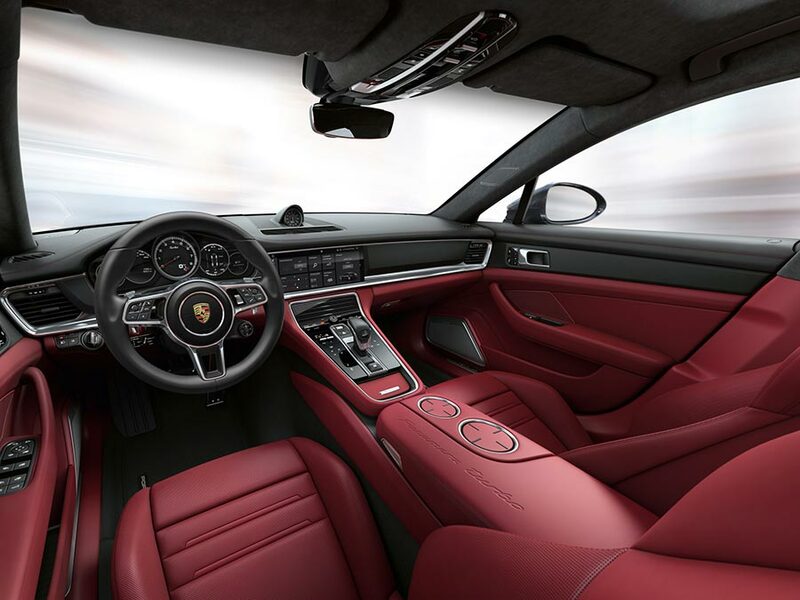 The digitalisation of the Porsche interior, which began with the 918 Spyder, is now available in the Stuttgart-based manufacturer’s four-door saloon. In the new Panamera, our customers and enthusiasts will experience a fundamentally redesigned car with new turbo engines, sharper exterior design, intuitive interior features and innovative technologies. The Turbo model launched here today is more powerful than its predecessor, whilst also significantly improving fuel economy and reducing emissions. As a result, this four-door saloon is a unique offering and an embodiment of comfort, performance, luxury presented in the most beautiful form. The enhancements applied to the new Panamera make it a true segment leader, one that I am sure will be well received here in India. The Panamera Turbo engine has been redesigned to produce more power, whilst significantly improving fuel economy and reducing emissions. With its powerful petrol engine, the Panamera Turbo’s new 4.0-litre twin-turbo V8 develops 550 hp at 5,750 rpm, with a maximum torque of 770 Nm between 1,960 and 4,500 rpm. It has 30 hp more than its predecessor as well as a torque increase of 70 Nm. The vehicle accelerates to 100 km/h in 3.8 seconds, whilst with the Sport Chrono Package the sprint time is down to 3.6 seconds. The new turbo model features a top speed of 306 km/h and a power-to-weight ratio of just 3.6 kg/hp. A lower combined fuel consumption of 9.4 – 9.3 l/100 km, is up to 1.1 l/100 km less than that of the previous model (NEDC), therefore equating to CO2 emissions of 214 – 212 g/km. The brand’s first eight-speed Porsche Doppelkupplung (PDK) transmission enables an even better gear ratio spread alongside a reduction in fuel consumption, because the seventh and eighth gears are designed as engine speed-reducing overdrive gears, meaning the vehicle reaches its top speed in sixth gear. Engine response can be further increased using the optional Mode Switch with the Sport Response Button. The Mode Switch, which was first introduced in the Porsche 918 Spyder, is an intuitively operated rotary ring on the steering wheel, which can be used to activate one of four driving modes (Normal, Sport, Sport Plus or Individual). Located at the centre of the switch is the Sport Response Button. It can be used to free up the maximum power potential of the Panamera at the press of a button. The Panamera Turbo applies its power to the road via Porsche Traction Management (PTM) – a permanent, fully variable all-wheel drive system. Tuned to the specific driving situation, PTM sensors continually monitor wheel speeds and perfect performance on dry roads as well as in wet conditions. At first glance, the unique concept and performance credentials of the four-door sports car are reflected in a new design which creates a stylistic link to Porsche’s design icon, the 911. Recognisable sports car aesthetics which make up the typical Porsche flyline in the new Panamera include pronounced shoulders, athletic flanks and an extremely fast roof line that is 20 mm lower at the rear. LED headlights and larger wheels also add to a sporty look. The sharpened exterior includes a completely new front-end design, with a crossbar in the radiator grille emphasising the car’s width and an arrow-shaped bonnet that features a prominently contoured powerdome. The rear of the vehicle now further highlights the Panamera’s four-door coupé credentials, distinguishing it from a conventional saloon. Features, such as the three-dimensional LED rear lights that include integrated four-point brake lights, interconnected by a narrow LED strip, result in a distinctive night design. 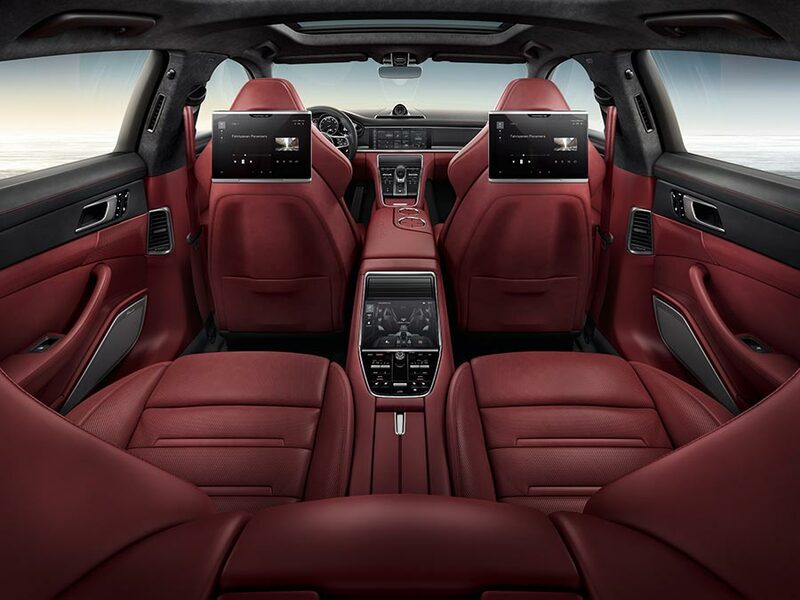 In keeping with the overall concept of the Panamera, the chassis unites the cruising comfort of a luxury saloon with the performance of a true sports car. This is achieved by supplementing the basic layout with innovative systems such as an adaptive air suspension with new three-chamber technology and Porsche Active Suspension Management (electronic damper control), the further enhanced Porsche Dynamic Chassis Control Sport system including Porsche Torque Vectoring Plus, as well as a new electromechanical steering system. The integrated 4D Chassis Control system analyses and synchronises all chassis systems in real time for even better handling. In combination with improved brake performance, Porsche is now also introducing rear axle steering adapted from the 918 Spyder and 911 Turbo to its Panamera range. 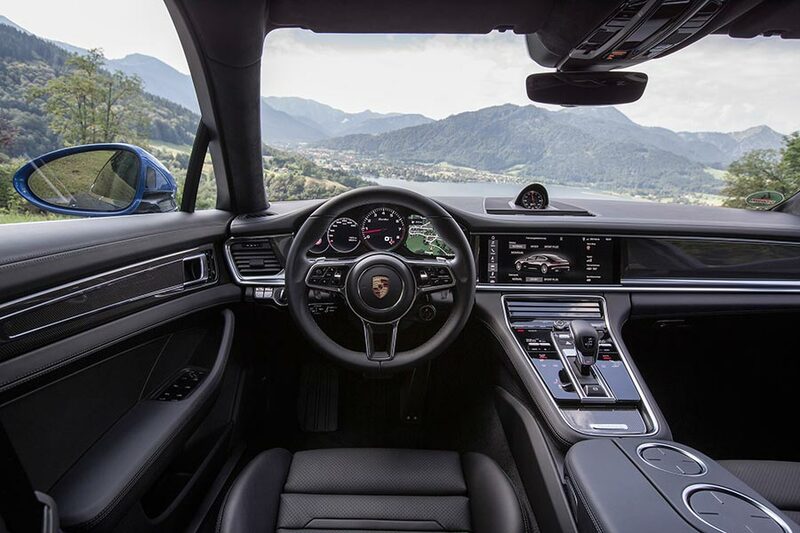 The luxury saloon drive experience is taken to a new level, through the functionality and easy interaction of the new Porsche Advanced Cockpit. Its intuitive user interface, makes operation of the communication, convenience and assistance systems easier than ever. 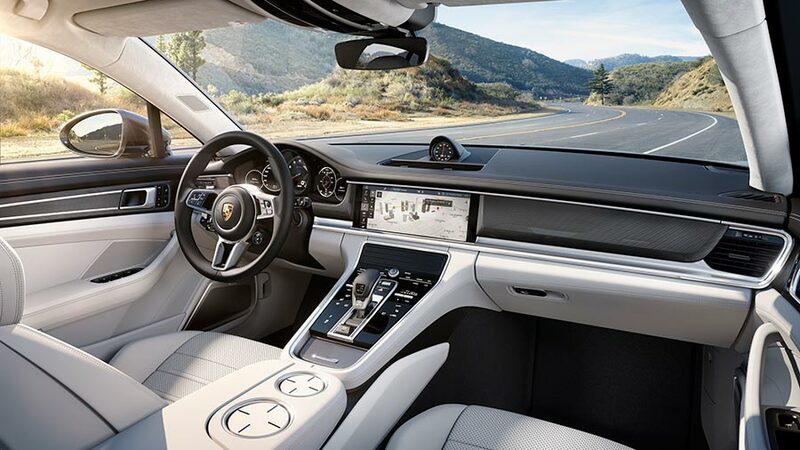 The 12.3-inch display touchscreen marks the next stage of development for the Porsche Communication Management (PCM) system. For the benefit of the driver, front and rear passengers, classic hard keys and conventional instruments have been significantly reduced. Instead they have been replaced with touch-sensitive panels and individually configurable displays. 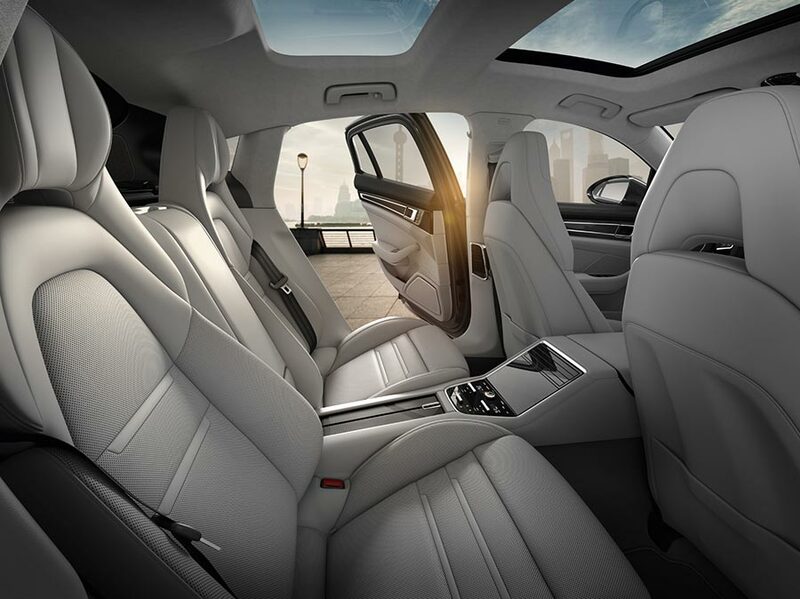 The Panamera Turbo Executive is equipped with various standard features, including a large panoramic roof, comfort seats with multi-way electrical adjustment in the front and rear, and roll-up sun blinds behind the headrests in the rear. The model also offers four-zone climate control and ambient lighting as standard. For enhanced comfort in the rear, customers can choose from a range of optional equipment, such as the newly developed large rear centre console, which can also be equipped with two integrated folding tables. The latest generation of Porsche Rear Seat Entertainment is available, with the 10.1-inch displays integrated in the backrests of the front seats that can be detached and used as tablets on the move outside of the vehicle. Presenting a harmonious balance between sporty performance, comfort and luxury, the new Panamera has been developed for sports car drivers who appreciate four doors and four seats. Achieving a new lap record for a luxury saloon of just 7 minutes 38 seconds on the legendary Nürburgring-Nordschleife circuit and a unique design concept that replicates the brand’s iconic 911, the revamped model is a truly attractive offering in its segment. The Panamera Turbo and Turbo Executive are available now. Further introductions include the Panamera Turbo S E-Hybrid, incl. a long-wheel base version, as well as the Panamera Turbo Sport Turismo, Porsche’s all-new body version revealed at the International Geneva Motor Show earlier this month.